An interactive Jupyter and colab notebook that prepares you to take the AWS Machine Learning Certification exam. 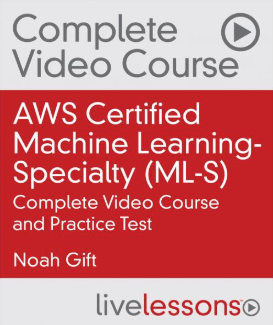 This book is based on a Video by Pearson AWS Certified Machine Learning-Specialty (ML-S). This Jupyter book and video was created by Noah Gift. Buying a copy of Pragmatic AI: An Introduction to Cloud-Based Machine Learning from Informit. Watching video Essential Machine Learning and AI with Python and Jupyter Notebook-Video-SafariOnline on Safari Books Online. Register for an upcoming online training on Safari.